The self-storage industry has much to be thankful for this Thanksgiving. Occupancy in self-storage facilities across America has never been higher. Interest rates remain low thanks to quantitative easing and a weak economy. Financing for self-storage acquisitions is abundant. This is a great period to be in self-storage, and yet there’s still a ton of deals out there to do, as most people do not even know of the opportunity. We’d also like to say thanks to our extended self-storage family. We really enjoy writing for you, and educating the public about this great industry. Have a Happy Thanksgiving! Some things are mandatory. And some things are optional. Self-storage is the first type. Americans have proven, after nearly eight years of recession, that they simply cannot live without their storage unit. And that’s great news for the industry. Here’s why self-storage is a necessity and not a luxury. Many American families are in turbulent times. They have lost jobs and homes. As a result, they have stored their goods in a self-storage unit rather than have to sell them and then buy them back later when their situation changes again. Indeed, it makes complete economic sense to store goods rather than to sell and re-purchase. Take a dining room set, for example. If you put that in a storage unit, it will cost $100 per month until you need it again. Let’s assume it costs $4,000 new. And let’s assume that you will get $1,000 if you sell it. Then storing the dining room set is your cheapest option. Otherwise, you’d come out of pocket at least $3,000 in this example. For many households, storing is mandatory, as they just can’t stop amassing goods. This is a particular part of American culture – we love to accumulate. Since this desire is never going to wane, the storage unit has become a regular part of the family, as there’s nowhere else to place all these items we buy. As long as Americans remain the most materialistic accumulators in the world, self-storage occupancy will remain high. Self-storage units rent for roughly $1 per square foot per month. A typical U.S. home, on the other hand, rents for significantly more. So using a self-storage unit to allow the maximum square footage of their residence to be free of obstructions is a smart financial move. As home prices continue to escalate, this ratio will only become greater, in favor of self-storage. In most American cities, the price per square foot for housing is close to $250 per square foot, with California and New York prices sometimes exceeding $1,000 per square foot. That sure makes the storage unit look cheap! When self-storage first came out, people who had never had a unit had to think long and hard if they wanted to add it to their budget. Today, almost everyone has a self-storage unit, and it is built into their household budget. As a result, the self-storage unit is seen as a normal expense and not a luxury. I’ve got $160 per month in my budget for my self-storage unit, what do you have? The economy has been in the Great Recession since 2007 – that’s over seven years now. Those products and services seen as “luxuries” have been clobbered by a sudden plunge in demand. Self-storage units are not a luxury, but rather seen as a necessity by the American consumer. And that’s a very valuable niche to be in. 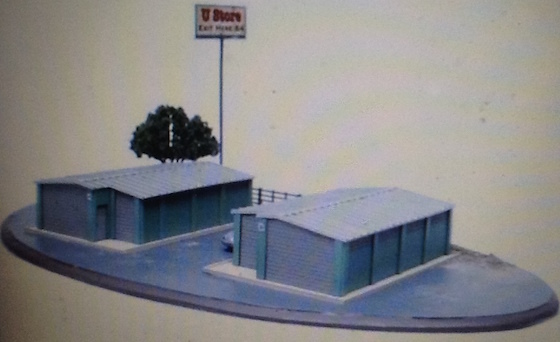 That is, if you are buying a model self-storage facility for a model railroad. We have noticed more and more touches of self-storage becoming a part of the American nostalgia market. For an industry that only began in the 1960’s, that’s pretty impressive. Of course, this model is going to have trouble making the numbers work, as it only has about ten units. Good thing the manager is free and there are no utilities or repairs to worry about. And the model railroad owner can always make sure that the location is not on the wrong side of the tracks. The biggest liability concern? Getting stepped on.